Staff Photo by Matt Fields-Johnson Bob Greving, left, has retired as chief financial officer of the Unum Group after 12 years, to be replaced by Rick McKenney who has served as the chief financial officer of SunLife, a Canadian company. Bob Greving has just about seen it all at Unum. 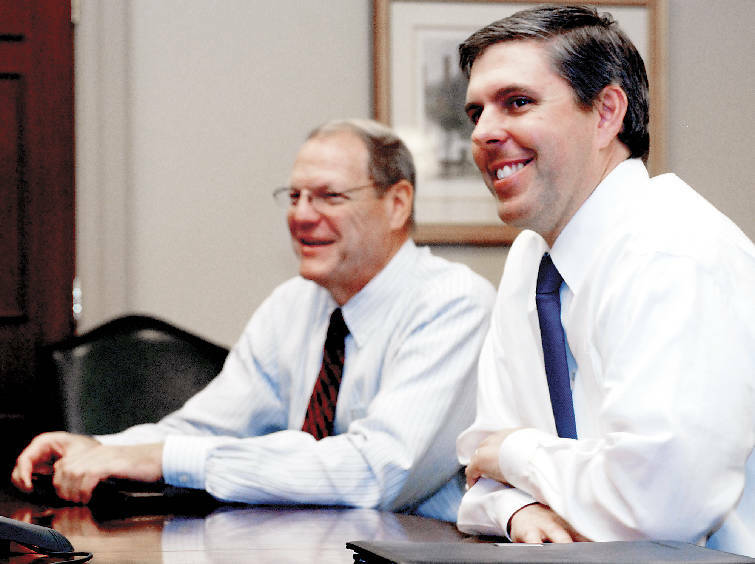 As the Chattanooga-based insurer's chief financial officer for more than 12 years, he helped facilitate mergers between Paul Revere Co. and Provident in 1997 and between Provident and Unum in 1999. He saw Unum's stock price plummet in 2003 amid allegations that the company was denying legitimate benefit claims, and he worked through a transition in leadership at the company and helped put Unum back on the right path. He will retire at the end of this month and leaves the company in solid shape for his replacement, Rick McKenney, who joins Unum from Sun Life in Canada. "It's been my objective to retire in my late 50s or near 60, and I'm approaching that," the 58-year-old CFO said. Mr. McKenney, 40, who was the chief financial officer at Sun Life before joining Unum in August, said he was attracted to Unum because of its strong management team and financial stability. "After meeting them, I decided it was a team I wanted to be a part of," Mr. McKenney said from the sixth floor of Unum's downtown headquarters. "It's a company that is very well positioned in the markets that it serves. Being in the worksite and distributing products through the worksite I think is something that is going to serve this company well in the future." As executive vice president and chief financial officer, Mr. McKenney is responsible for evaluating and establishing key strategies for the financial performance of the company. He said he will continue with the conservative, well-disciplined approach left behind by Mr. Greving. "As we look at the current economic situation, I think it is going to be a continuation of what Bob and the team have done here for a period of time, whether it is the strength of the balance sheet, the products that we write or the risk management that we employ," he said. "I don't think that really changes. As we look forward, we have to determine how we capitalize on that position of strength. We will continue to grow the company and decide which markets we continue to develop in and how we are going to invest this capital that we have now accumulated through this difficult time." In the meantime, Mr. Greving said he will spend more time with his family, do some traveling and concentrate on his position on the Memorial Hospital board of trustees. He was appointed to that position in July. "I've always been able to write checks, but I have never been able to give anything of my time to charitable or civic activities, and I would like to do more of that," he said. Mr. McKenney tipped his hat to Mr. Greving for the job he has done at Unum and for making the transition a smooth and seamless process. "Kudos to Bob," Mr. McKenney said. "He's a class act." Prior Experience: General Electric, 1991 to 2004; Genworth Financial, 2004 to 2007; Sun Life Financial, 2007 to 2009.